The Bobby Labonte Foundation is a 501(c) (3) nonprofit organization founded by NASCAR champion and businessman Bobby Labonte in 2003. The Bobby Labonte Foundation vision is a cohesive community in which parents and families are empowered to fulfill children's needs and together find joy, love and happiness. 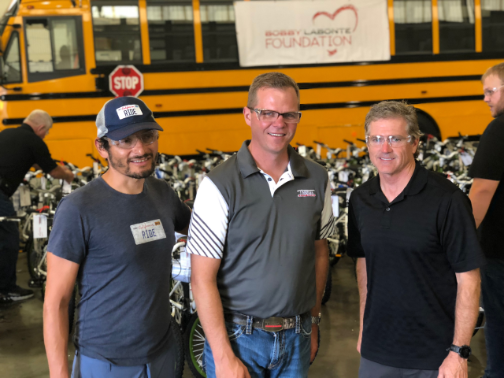 The Bobby Labonte Foundation works in partnership with the local community and community organizations to empower parents, families and children to build a strong foundation for children's futures. For more information, visit www.bobbylabontefoundation.org or follow the Bobby Labonte Foundation on Facebook. Bobby Labonte visits Thomas Built Buses for Bike Build Day, where bicycles were assembled and later donated to local High Point nonprofits. Pictured from left to right: “Fast” Freddie Rodriguez, Caley Edgerly and Bobby Labonte.